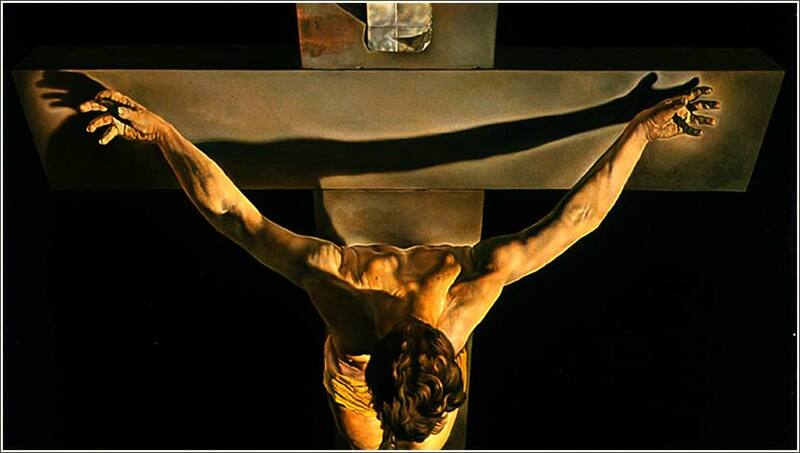 Christ of Saint John of the Cross (detail) by Salvador Dali, ca. 1951. 477 people in our community are currently praying with you. Dear Holy God, I remember today all those who spend their lives denoucing Christ; the sarcastic atheists who make fun of believers; the people whose careers are built on trying to discredit your Word; and all those who follow false, dead-end religions. Help me to expunge any anger I may feel when attacked by such people, or when I hear their misguided words. Let your Spirit be strong in me, to educate my tongue, if I am called upon to respond to one of them; and let me always answer in love and serenity. These verses strongly reinforce the preceding verses, i.e., that Paul did not seek to please men by modifying his Gospel, but sought to please God by always speaking the truth. Here, then, he gives the reason underlying and supporting his refusal to compromise his teachings. What has been written by one person can always be criticized, improved upon, disputed, or ignored by another. What has been revealed as the will of God cannot. And so Paul cements his position by this, the topic of the rest of Chapter 1 of Galatians: evidence that the Gospel he teaches was not written by him, nor taught to him by men, but revealed to him directly by Christ. n the road to Damascus — and if you are not familiar with it, please read the account of Paul's conversion in Acts 9:1-19, because you will need to know this to understand Galatians — when Paul was converted, he experienced Christ. He did not see a human Jesus, but a flash of light and a voice; still, this was a “theophany”, a physical appearance of God to a human being. Paul “saw” Christ, in the figurative sense, and heard Him in the literal. Thus, v. 11 says two things at once. Christ was revealed to Paul; and Christ revealed to Paul what He wanted Paul to teach. Greek uses fewer words than English to say the same thing, and this is one of the tricks that makes it possible. There are 138,000 words in the Greek New Testament and 180,000 in the KJV, but this does not tell the whole story. The Greek original did not have punctuation, and so there are tens of thousands of Greeks words needed for technical purposes, mostly conjunctions (almost every verse in the Greek Bible contains a conjunction of some sort) and the definite article (“the”) used only to indicate the case or function of the following word. These are not generally translated as English words, but as periods and paragraphs, or a change in word order. So the density of Greek is perhaps 50% higher than English. 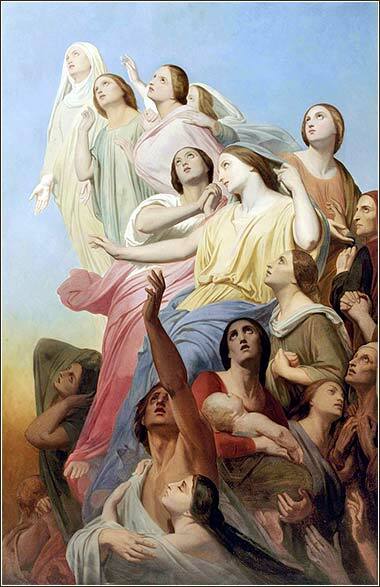 The Miseries of the Earth Which Transform in Hope by Rising Towards Heaven by Ary Scheffer, ca. 1858 (just before he died).